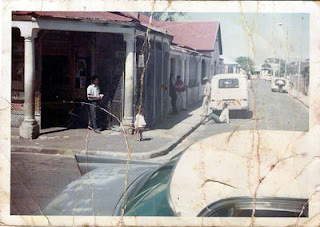 I’ve been living in Harfield Village for 26 years this time round & it has been some of the happiest times of my life. I’m originally a refugee from Rhodesia who fled when the Bush War began, so this was a great blessing for me. I am a gypsy, who found roots for the 1st time when I came back to live here after living all over the Peninsula. I have lived in grander more practical houses but I’ve never had a better home. In 1989 I visited the area attracted by a newspaper advert to attend a Writers Salon one evening, which was a regular sociable event with dinner & wine given by a writer called Glynn Croudace. He was retired from the Cape Times but still writing & teaching. He was famous for his plays on Springbok Radio called “The Destined Hour” which some of you may remember as this was very entertaining & yet philosophical too. As I write this I can almost hear Glynn say over my shoulder that this form of sociability was rather suitable one, as a writer’s life is a rather lonely one. I remember standing outside this house that was to become mine & feeling a very welcoming & warm atmosphere coming from the house. Even more unexpectedly was when I fell in love with Glynn, as he was far older than me but we were kindred spirits & before long I ended up living here. Then later marrying him! My husband Glynn lived through & witnessed many more changes than I have, as he lived here for through the two decades before I returned. He was newly divorced with very little money when he moved here through necessity. The cottage called Hamilton Villa was in a very bad state. Glynn did many renovations over time & this task I took over from him & this is still on going to this day! I was already familiar with the area because I originally lived here in the early 1970’s, directly opposite the Harfield Village Station in a Council House. I shared this house with my husband Garth, my small daughter Genevieve & our business partners Johan & Ross. It was a large solid Victorian House with a large garden big enough for us to work from home & we had just opened a unique rather exotic shop called Sharg & Gathron’s Circus in the first shopping centre in Cape Town ~ the newly built Cavendish Square in Claremont. I had a room for designing & manufacturing alternative feminine clothing, Garth & Johan had another for leatherwork. Ross ran the shop & I worked there too in the School Holidays & on Saturdays. There was no Sunday trading in those days! It was still a mixed area of people as although it had been declared for white occupation only on the 14th of November 1969, it took the government the next two decades to forcibly moving a large number of coloured residents out of the area. I would highly recommend that you read the excellent History of Harfield which is part the website, where I learnt more about this while I researched for this article. We had a very colourful Shabeen with a very mixed clientele next door to us some of which belonged to the gangs & were often recently out of jail for various crimes. The crime rate was escalating in the area in the 1970’s but was nothing like what we are experiencing today. We had only one very unpleasant burglary but otherwise we lived in harmony with the residents, although it was a time of great & sad change. I feel the most appropriate photos of the 19 70’s were street scenes, as a hard working Hippie that is mostly what I saw in my everyday life. There were always guys hanging around talking & watching….It was a kind of past time! 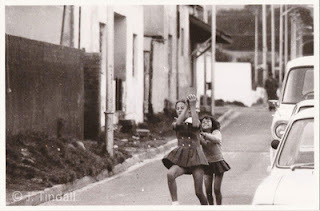 Children playing in the streets like it was their back yard. Streets were great very sociable places unlike today! I used to walk to the local shop in 1st Avenue which still exists today to buy a few necessities like bread & milk. I became used to the men who were socialising outside, although it was unfamiliar at first. I have a vague memory of great sadness as I think the owner whose name I think was Ali died of a broken heart before he could be forcibly removed. I walked my daughter Genevieve to the Waldorf School Michael Oak in Kenilworth & home again every day. 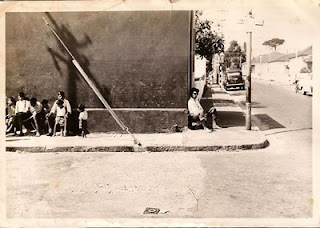 It was on those occasions that I was in the street as I could not yet drive a car, that I became familiar with the children playing in the street. I never felt threatened walking on these occasions as there was a friendly atmosphere here generally, but the subway to the other side of the railway track was never a pleasant place! I remember being very intimidated by the authorities of this time myself, as our situation was precarious not being South African & being afraid of being sent back to a crumbling Rhodesia in the process of becoming Zimbabwe. We were working very hard during this time which led to our success & we moved on to rent a beautiful historic house in Constantia called “Fair View Farm” but a certain fondness always remained in my heart for the area. I have lived here now for two & a half decades, self-employed working from home teaching sewing & seen myself the many more changes as we continue to adapt & evolve to our environment becoming a united community of mixed residents once more.